Subscribe to the newsletter and don't miss out on all the tips and tricks for your dream trip. I’m going to start this post with the fact that not many people actually know about Meteora. I guess that’s probably because Greece is known more for its beautiful blue islands. If you ask me, places like these make my trip more satisfying than anything else. 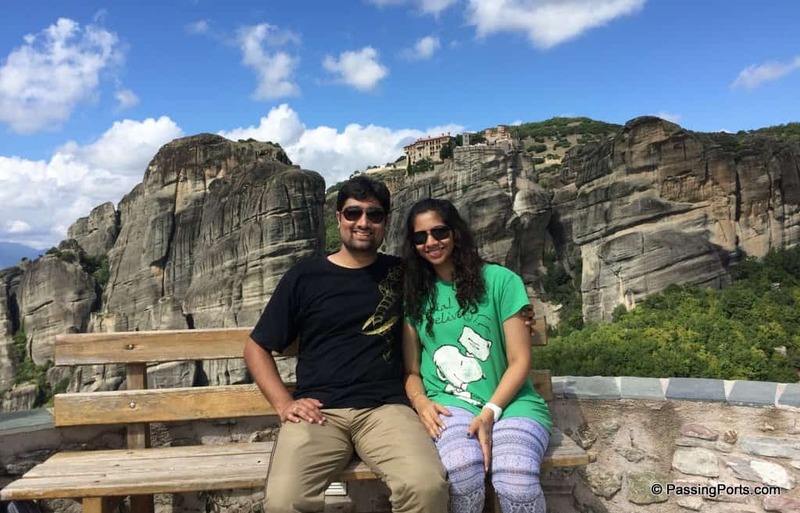 Short version: Things to know before heading to Meteora. Train Route: Sthamos Larisis (Athens)-Paleofarsalos-Kalabaka. Taxi was €4 (that’s the minimum fare) from town to our hotel. Taxis are not available at the top. If you can’t walk much, suggest you hire a taxi or rent a car to do this whole trip. Views are breath taking, carry a camera. €3 entry for every monastery. 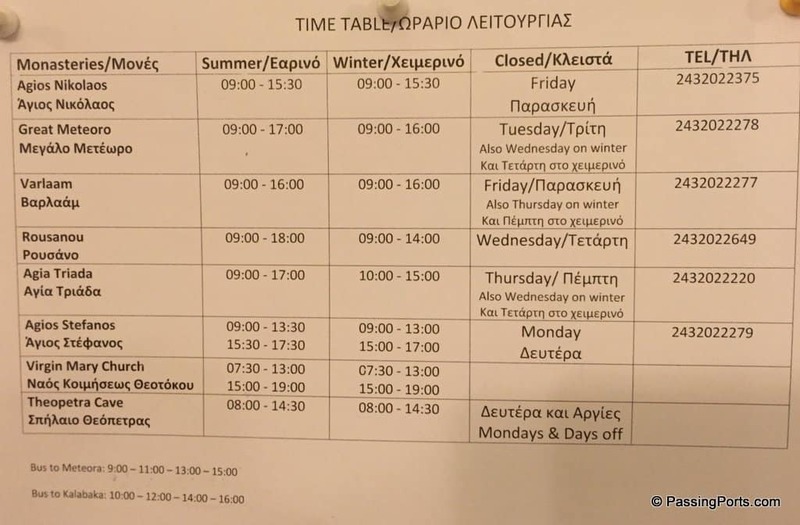 All monasteries are closed on different days of the week. Sunday is the only day where all are open. They are strict about dress code. Please make sure you wear clothes with sleeves, long trousers and skirts. They also provide shawls for those who are not dressed appropriately. Carry water and food to make sure you have the energy for all the walking/climbing. Shoes will help with the walk. From Holy Trinity, there is a short climb down to the city of Kalabaka. Meteora was after spending two days at Athens. Long version: I haven’t heard of even one person who spent a few days in Greece and did not visit the beautiful monasteries of Meteora, unless they’ve never heard of it of course. Around 350-400 km from Athens, this quaint little town is different from any place that you might ever visit. By train – from Sthamos Larissis to Paleofarsalos and change trains to Kalabaka. We booked our tickets online at least a month and a half in advance. Book Greece train tickets. We took a train to reach Kalabaka at 6AM and walked around to find a hotel as it was really cold and the city was not awake yet. Few minutes from the railway station we checked into Hotel Edelweiss – bargained for a double bedroom for €25 and checked in. 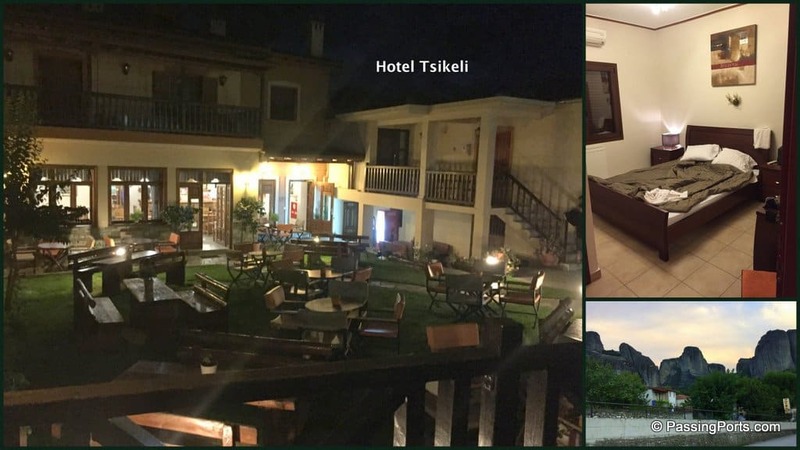 By 10 AM we were out of the hotel to head for breakfast, found a taxi only at the town square and left for Hotel Tsikeli (beautiful property, btw) in Kastraki. Paid €4 for the taxi, left our bags in the hotel and asked them to arrange another taxi who could take us to the Grand Meteora monastery. Taxi fare – €10. We began with the Grand Meteora which is the largest, oldest and is at the highest peak. The locals say that this is one that you must not miss when in Meteora. Next, we went to Varlaam, and then proceeded to Roussanou which is a nunnery and walked all the way to Holy Trinity. This is a LOT of walking and climbing up. Every monastery charges €3 as entry fee. By the time we reached Holy Trinity, we were drained completely as there was no place for food, coffee etc but for small pantry vans (found only near Grand Meteora and Varlaam), was a hot day and the chill breeze was not of much help. The views were just fantastic apart from the rich history that each place holds. As I write this, I get goosebumps thinking about how the monks built these monasteries of Meteora and protected themselves from enemy intrusions. Every monastery has almost the same setup – a place for worship, rooms and views. So if you ask me, I’ll suggest not more than two. Also paying an entry of €3 in every monastery was a bummer in my opinion. We also got a chance to listen to the Holy Hymns in – something that I have heard only in Hollywood movies. To hear it live in such an ambience was surreal. Also Read: Mykonos - To Miss Or Not! Founder of Passing Ports, Preethika is a traveler whom you just can't ignore. A juggler between office hours and personal life, nothing gets her more excited than exploring new destinations and cultures. Extremely passionate about going to lesser known places, Preethika started penning down her experiences, and Passing Ports is the result of that love for travel, thus inspiring others to experience a life beyond the rants of our daily lives. Athens - Hippie Yet Happening! This is how I spent five days in Andaman Islands, and so can you! Planning for A Greece Trip? Copyrights © 2015-19 Passing Ports. All Rights Reserved.